The home of Red Apple Ranch, Murphys sprang into creation thanks to the historic California Gold Rush. While the people of Murphys have done their very best to retain the town’s Gold Rush charm and history, it is still a living, breathing, thriving town — a town where children go to school, where folks meet at their favorite tasting room for good wine and good company, where people call home. A few miles south of Murphys is a town that had similar beginnings with, perhaps, a bumpier road. Columbia, California had twenty years of steady growth in the mid-1800s but, by 1870s and 1880s, the easily mined placer gold had all but vanished and the town quickly began to decline. Buildings were vacated, then torn down in last-ditch attempts at mining every corner of the town. The population dwindled from its peak of about 6000 down to about 500. As years passed, the town had begun to crumble as abandoned buildings became dilapidated and funding for the unincorporated community was lacking, the town finally turned to the state of California in hopes the state would salvage what was left of the historical town. In 1945, state legislature appropriated $50,000 to be matched by public subscription for the acquisition of lands and buildings in the old business section of Columbia. Buildings were restored, unkempt land was given a solid cleanup and Columbia State Historic Park was born. From that, the town of Columbia has survived and continued to thrive. 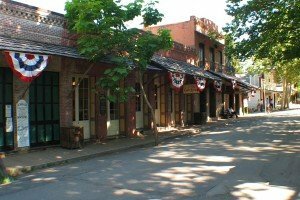 Columbia State Historic Park is a fully and faithfully restored old-town Columbia — a Gold Rush era time capsule offering parades, town tours, music festivals and historic reenactments. It’s a chance to see how places like Columbia and Murphys came to be and a unique chance to understand the history of the area first-hand.